Most photographers are missing a big strategy in their online marketing — a strategy designed to generate a consistent flow of leads with whom they can have a real conversation to move them closer to becoming a paying client. The idea of “Lead-Generation” is the central theme of this series, and we’ll be looking at various aspects of it in detail as we go. Very simply, photographers are having a hard time finding new clients to book their services or to buy from them. This is the number one thing they tell me when I ask what’s holding them up. Obviously, making money with your studio will be tough without customers, and it’s a common enough problem, but the majority of photographers blame the wrong things! I hate to be the one to say this, but those are nothing more than excuses — and bad ones, too! Sure, it’s easy to pick up a camera and think you’re a professional photographer, but that doesn’t necessarily make you one, does it? Furthermore, most of us (probably including you too) started out like that, right? Despite some established photographers feeling territorial about their chosen niche, there’s actually nothing wrong with someone pursuing a life in professional photography if they have a real passion for it, just like you and I did at one time. And you can’t blame consumers for hiring cheaper photographers because it’s only natural in the absence of some truly compelling reasons for them to pay more and hire you instead. As for seeing photography as valuable, that’s so subjective and covers a wide spectrum of people. It’s always been that way, and there are some who see photography as nothing more than a commodity, while others would hurl themselves into a burning building to save a precious and irreplaceable portrait. The truth is, there are plenty of photographers making a living doing what they love. We just don’t hear about them too much because they’re quietly going about being successful. If all this is true, then “why isn’t it working for me?” is the next question I usually hear. Generally speaking, most photographers are all over the place when it comes to running their businesses. They have no concrete managerial processes in place, and there’s a distinct lack of focus on creating the proper systems to increase their chances of success. With respect to marketing, it’s one of those systems that I want to talk about here. I refer to it as “Attract, Connect, and Convert Lead-Generation“, and its simplicity is what makes it so powerful. In this chapter, I’ll give you a brief overview of the system and how it’s supposed to work, and then we’ll take a deeper dive into the main components in following chapters. “Leads” are real people who love what you do and have raised a hand to let you know they’re interested in learning more about you and your photography. Lead-generation also happens to be the main purpose of your website. We all need a website these days, but the fundamental reason for its existence has been all but forgotten. 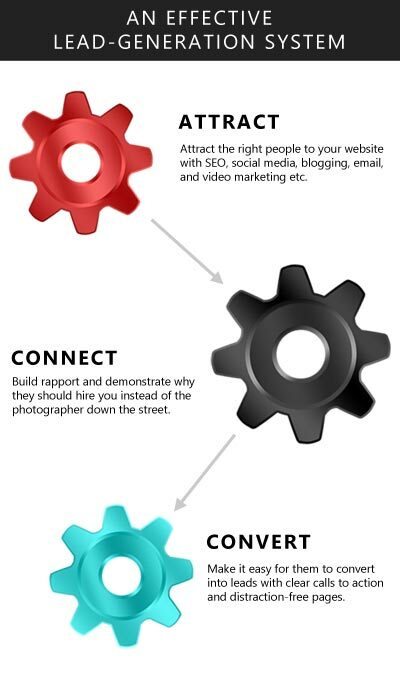 Instead of lead-generation, photographers are often more focused on showing off their work in the hope it will be enough to get people to call them or get in touch by email to start the sales process. Sorry, but it just doesn’t work like that. With an attention span of only a few seconds, most prospects are off to the next photographer’s website before you’ve had a chance to make a real impression on them. At the end of the day, a prospect might choose to get in touch with a photographer more because they’re tired of looking than because of how they feel about the photographer they’re considering. Think about it—do you want people to leave your website within seconds, especially if they’re a close fit to the profile of your ideal client? Doesn’t it upset you to know that the only reason you’re talking to someone is because they got bored of looking through websites? Next time you speak to a prospect on the phone, ask them how their search for a photographer is going. Then ask them to tell you which of the photographs they’ve looked at so far resonated with them the most. The usual answer is something like, “I can’t really say. I’ve looked at so many they all seem like a blur”. It’s nothing more than random chance. One thing is certain—success may be difficult to attain but it never happens as a result of luck. Lead-generation, when done properly, is not random. It’s a system that takes your website visitors, sorts out the ideal prospects from the not-so-ideal ones, and then leads the ideal prospects to the point where they can easily make themselves known to you. Since your website was intended from the beginning to be your online lead-generator, it makes perfect sense that your website should take its place at the hub of everything else you do in your marketing. To achieve the goal of getting more leads, and ultimately more clients for your business, the process is broken down into 3 major parts. Part 1 is the attraction phase—the various strategies and tactics that will put your brand and your marketing message in front of the right people at the right time to attract them to your website. Part 2 is the connection phase. This is where you make a real human connection with your prospects once they land on the website. By connecting with them, I don’t mean following you on Twitter or becoming a Facebook fan, but instead making a meaningful connection on a deeper level. It’s like when you meet someone for the first time and you feel like you’ve known them for years after only talking with them for a few minutes—you feel like you’re both on the same wavelength and you understand each other. In short, your marketing message resonates with them, and working with you becomes a natural next step for them to take. Part 3 is the easiest part as long as you’ve gotten the rest of it right and you follow a few basic rules. Here, you need to convert your prospect into someone with a name, email address or phone number you can then follow up with. Until that point they’re completely anonymous and nothing more than an IP address of a website visitor. We’ll talk a little bit more about these three phases in more detail in a minute, but there are some things you need to do before you can implement this type of strategy for it to have the best chance of working. It all starts with what we call your essential message. I don’t mean essential in the sense that it’s required, even though it obviously is needed, but in the sense of it being the essence of who you are as a photographer, the core values that your business stands for, the main benefit your clients enjoy from working with you, and—most importantly—why you do what you do. I know that sounds like a lot to cram into one short statement, but imagine if you could boil your business all the way down to its basic components, your essential message would be what’s left. The essential message is unique to you and your photography business because you are at its core and there’s only one of you. It’s a brief and simple statement designed to be read and understood by your ideal prospects as quickly as possible. In fact, your ideal clients—the people you most enjoy working with—may understand your essential message a lot faster than others who aren’t on the same wavelength as you. Next, you need to know who you’re going to be talking to. In other words, who are these ideal prospects we’ve been referring to so much? The more details you know about them the better off you’ll be, and the more targeted you can make your marketing messages. For example, where do they live, what type of family life do they have, where do they work, who do they socialize with outside of work, what movies, books and music do they enjoy, how do they see photography as a part of their lives etc. Of course, not all of your actual clients will be an exact fit for your ideal criteria, but they’ll be close enough in many ways to resemble your ideal standard in at least most areas. The key takeaway here is to know what it is you want to say, with as much clarity as possible, who you’ll be saying it to, and then tailoring the message to fit neatly with the way your prospects think about and view photography. With the essential message out of the way, here’s a quick overview of the three parts of our new strategy so you’ll know what you’ll be dealing with as you move forward. Clearly, there’s no sense having a website if no one ever comes. That would be a bit like opening a fancy restaurant in the desert—great food, but no one to enjoy it. We also can’t rely on the “build it and they will come” approach that Kevin Costner was lucky enough to benefit from in the movie Field Of Dreams. The Internet doesn’t work like that and visitors aren’t likely to just show up simply because the website is there, or at least not the right kind of visitors. You therefore need to attract people, and there are various tools for doing that. The first one, which most people seem to be scared to death about, is search engine optimization (SEO). There are so many horror stories and myths around SEO that I wouldn’t know where to start, and a lot of good photographers have been so put off by it that their businesses have suffered badly as a result. But the truth is, SEO is not as hard as you might think it is, and you don’t need to do nearly as much of it as you might imagine. Another great tool for attraction is content marketing, which is being talked about a lot these days but has actually been around for a long time. Content marketing is simply the practice of creating great material on your website in the form of articles, blog posts, videos and other media that will appeal to the right audience, namely your target market. Paid advertising is also becoming a more necessary option for attracting prospects, and Facebook advertising is particularly effective for that when done properly and to the right audience. Talking of Facebook, social media is ideal for projecting the persona of your business to your clients and encouraging them to interact with you and your brand on a deeper level, leading them back to your website at some point. Then we have blogging, together with video marketing, and direct referrals. All of these are tools you can use to send more people to your website. The important key is to know which ones to use and when. This is where a lot of photographers mess up because they look at what others are doing and then assume they must do the same thing, but find it doesn’t work for them. Instead, you have to know where you are in your business, and pick the right tools for the right job at the time when they’re needed the most. Next, you’ll need to connect on a personal level with your prospects. This involves clearly communicating the reasons why someone should hire you, instead of the photographer down the street. Your toolbox for this area of your marketing mainly revolves around copywriting and content marketing (the mechanics of creating the content itself). Copywriting is simply the term we use to describe the craft of writing the words—the copy—that will appear in your marketing materials, whether on the website, in a social media post, or some other form of marketing. Your marketing copy is the single most important element of your website, perhaps more important than the photographs you choose to show. We’ll go into the reasons for that in the detailed chapter on connection. Copywriting itself is a huge topic, made up of a series of other tools you can use to get your message across most effectively. As I said before, the purpose of all this is to make a deep connection with your visitors about why you do what you do, the main benefits they’ll enjoy from working with you, what you do, and what makes you different from everyone else competing for attention. Speaking of attention, that’s precisely what your website and marketing materials need to capture—people’s attention. What you really need to do is quickly turn that attention into genuine interest. When someone is truly interested in what you have to say, it makes them more immune to distractions going on around them and keeps them focused on what you’re saying. Finally, there’s the conversion part. This is where you reap the benefits of everything you’ve done so far, and you’re rewarded with a good-quality lead in the form of someone who is genuinely interested and excited to learn more about how you can help them. If you’ve done your job properly in the attraction and connection phases, you’ll find that the conversion phase is a lot easier than you might have expected because much of the heavy lifting of persuasion has already been done. But that doesn’t mean you can be lazy. There are some important aspects to conversion, and a whole branch of marketing science dedicated to measuring and improving it. There are several tools you can bring to bear here and many of the copywriting elements also apply. For example, headlines and creating engaging copy. Then we have landing pages, which have both connection and conversion often blended into one entity. Of course, the biggest tool at your disposal is your call to action. There are many ways to make sure this is as effective as possible to maximize the number of people who take the action you want them to, and we’ll go into some of those in a later chapter. The attract, connect and convert lead-generation system needs to be engineered to maximize the number of high-quality leads you need in order to make bookings or sell your work. There are many tools you can use as part of this strategy, but it’s important to know when to use them as much as how to use them, and there’s no “one size fits all” marketing system that works for everyone. That’s why many of the so-called photography success systems we see being touted around by some of the “rock star” photographers out there simply don’t work for a lot of the people who buy them. In the end, you need to build something that works for you.